The neighborhood was originally part of a very large farm owned by John Whitley. Mr. Whitley obtained the land in 1835 in the original land grant from the state. Jesse Wood obtained the land in 1847 from H. H. Embry. Mr. Wood immigrated to the United States with his family from Dublin, Ireland in 1800. Mr. Wood’s farm stretched from Peachtree Creek to the north, Atlanta Water Works to the south, Howell Mill Road to the west and Spring Street to the east. Mr. Wood then split the land among his sons. E.H. Wood received the land where Berkeley Park is currently located from his father Jesse in 1874. E.H. was the first minister of Peachtree Road Methodist Church. E.H. subdivided the land and began developing it in 1921. Berkeley Park was developed by E. Rivers Realty company in the 1920s. At that time, Berkeley Park was considered the area “contiguous to Howell Mill Rd between Chattahoochee Ave and Collier Rd.” Prior to this, the area that became Berkeley Park was mostly farmland, cow pastures, and meadows. Most of the current roads were already in place, but were unpaved. Civil War historians believe that Berkeley Park was located on several trench lines that ran along Bellemeade Avenue. The spot at the corner of Bellemeade and Tallulah/Commerce provided an excellent vantage point for soldiers to see northward, due to its height. In 1993, a Berkeley Park resident using a metal detector found several Confederate bullets and a silver button from a Confederate uniform on property on Bellemeade Avenue. The items were imbedded about 7 inches below the soil line. After the Civil War, the barracks at Camp Oglethorpe were broken down and it is believed that the lumber was sold to home builders who used some of it in construction of homes in Berkeley Park. The early Berkeley Park homes were purchased for between $1,000 and $1,900. In the early days, most Berkeley Park families often purchased their homes with the intent to live in them the rest of their lives. In the early part of the 1900’s most residents made their living off the land or owned and/or worked in small businesses in the area. Each property had an outhouse in the back yard, which was serviced by a businessman who arrived by horse and cart. The homes were heated either by wood or coal fireplaces or kerosene cook stoves and lighted by kerosene lamps. Each home had a well that provided water. Berkeley Park is listed on the National Register of Historic Places. In February, 1999 a committee of 3 individuals was created with the intent of capturing the history of Berkeley Park through the memories of the existing long-term residents. Linda Alcott, Dwight Glover and Tom Hawley conducted a series of interviews with each available long-term resident to document their memories of past times in Berkeley Park. With the support of each participating resident, we hope to forever preserve the origins of our community and the lives of those who created the history of Berkeley Park. We have an enormous wealth of history still alive today in Berkeley Park. The neighborhood was originally part of a very large farm owned by John Whitley. Mr. Whitley obtained the land in 1835 in the original land grant from the state. Jesse Wood obtained the land in 1847 from H. H. Embry. Mr. Wood immigrated to the United States with his family from Dublin, Ireland in 1800. Mr. Wood’s farm stretched from Peachtree Creek to the north, Atlanta Water Works to the south, Howell Mill Road to the west to and Spring Street to the east. Mr. Wood then split the land among his sons. E.H. Wood received the land where Berkeley Park is currently located from his father Jesse in 1874. E.H. was the first minister of Peachtree Road Methodist Church. E.H. subdivided the land and began developing it in 1921 (see enclosed lot subdivision survey maps). In the 1920’s Berkeley Park had just a handful of homes scattered throughout it’s boundaries. At this time, our community was mostly farm-land, cow pastures and meadows. With the exception of Northside Drive (from Collier to about Bellemeade Avenue), the east end of Bellemeade Avenue and the mid section of Holmes Street, most of the current roads were already in place. They were, however, all still dirt at the time. Civil War historians believe that Berkeley Park was located on several trench lines that ran along Bellemeade Avenue. The spot at the corner of Bellemeade and Tallulah/Commerce, provided an excellent vantage point for soldiers to see northward, due to its height. In 1993, a Berkely Park resident using a metal detector found several Confederate bullets and a silver button from a Confederate uniform on a property on Bellemeade Avenue. The items were imbedded about 7 inches below the soil line. After the Civil War, the barricks at Camp Oglethorpe were broken down and it is believed that the lumber was sold to home builders who used some of it in the homes in Berkeley Park. The early Berkeley Park homes were purchased for between $1,000 and $1,900. In the early days of Berkeley Park families most often purchased their homes with the intent to live in them the rest of their lives. In fact, in 1999 we still have two current residents who were born and raised in our community. Ruby Parker was born in 1908 on a farm located approximately where I-75 and Northside Drive currently meet, within a few feet of the boundaries of Berkeley Park. Ruby is the only current resident we have confirmed that actually attended E.P. Howell School, which used to be on Bowen Street. In addition, Katherine Kent was born in 1927 in the very home she now resides in. The house was originally owned by her grandparents, then passed down to Katherine’s parents, and finally to Katherine. Three generations of both Ruby and Katherine’s families have lived in Berkeley Park. In the early part of the 1900’s most residents made their living off the land, or owned and/or worked in small businesses in the area. Each property had an out- house in the back yard, which was serviced by a businessman who arrived by horse and cart. The homes were heated either by wood or coal fireplaces or kerosene cook stoves and lighted by kerosene lamps. Each home had a well that provided water. Evan P. Howell Grammar School was located on Bowen Street during the early 1900s. Ruby Parker recalled the principal then was Fanny Bettis. Fanny and her twin brother built identical houses across the street from each other, located approximately where Howell Mill and I-75 currently meet. The brother married, had a family and owned and operated a slaughter house in the area. Fanny also taught 7th grade while acting as the principal. She and her brother started the Methodist Church on DeFoors. In 1928 E. P. Howell Grammar School moved to Howell Mill and White Street, (where Kroger is currently located). It remained at that location until 1988, when it was demolished. Many of our residents, or their children attended E.P. Howell at White Street. All the children walked to school then. One of our residents remembers walking to school in the mid 1930’s. “We walked to school, rain or shine. It seemed like a very long walk but we walked with waves of kids from farther on down DeFoors. There was an old lumber yard at the corner of Howell Mill Road and White Street and the Addy family lived next door.” Addy’s Filling Station was subsequently built on the site. On the opposite corner was the Wylie Underwood home. Mr. Underwood had a wonderful outdoor fish pond which drew the attention of E.P. Howell children. “We were instructed to only walk on one side of the street, but at times the fish and pond drew us over the line”. Most residents attended the churches in the area. Each of the original churches is still serving the community to this day. These include Northside Park Baptist Church on Howell Mill, which was established in 1907, and Underwood Methodist Church, which was founded in 1914. Underwood Methodist Church is on the corner of Howell Mill and Holmes Street, within the boundaries of Berkeley Park. The church began when “a Sunday School class was started by Mrs. Byron Bettis, Sr., Mrs. M. J. Brown (“Grandma Brown”), Purvis Cranshaw and Claude Bennett. The first meeting was in Grandma Brown’s home with 10 people in attendance. The following year several places were used for meetings. During the summer of 1915, Rev. J. W. Cranshaw held a Tent Revival on the corner of Howell Mill and Ridgeway Avenue. The ladies of the church brought an old organ to the meeting and services began.” The idea to organize a church with regular services was sparked during this revival. The first church was erected on DeFoor Avenue, across from Springer Street. It had a dirt floor with sawdust on the ground, rough benches, kerosene lamps, and a platform for the choir. The church continued to grow and in 1917 Rev. M. L. Underwood became pastor. The members decided if a lot could be secured, they would build a “real” church. A lot at the corner of Holmes Street and Howell Mill was purchased and a new church was built in 1920. The church was built of granite hauled from the nearby Harper’s Quarry on DeFoor Avenue. The total cost of the building was $10,000 and was almost paid for by the time the building was completed. The name Underwood Methodist was in honor of Rev. Underwood. In 1938 Rev. George W. Barrett was appointed to the church. His tenure lasted eight years, the longest tenure of any a pastor. On many occasions through the years the pastors from Underwood Methodist and Northside Park Baptist would lead assembly programs at E.P. Howell Grammar School. In the late 1930’s, a Soapbox Derby was regularly held on Northside Drive. The participants were required to build their own cars. The cars were not motorized and would run from Bishop Street to the bottom of the hill, which was about where Antone Street is today. There were no traffic lights and very little car traffic. Northside Drive was a narrow road then. The local businesses were very different in the 1930’s and 1940’s than they are today. All of the businesses were small and owned by people living in the area. Some were Berkeley Park residents, like Jim Thompson who owned Thompson’s Garage on Bellemeade Avenue, and Mr. Crane who owned Crane’s Garage on Howell Mill and lived on Verner Street. A past resident of DeFoor Road recounted his experiences frequenting businesses that were in our community in the 1920’s and beyond; “Crane’s old wooden service station is where we received our papers for delivery. Wimpy’s Hotdog Stand was in the side of the same building. For 20 cents you could get a hot dog or hamburger, and a moon pie and drink. The stools at Wimpy’s were set at an angle because the floor slanted north by northwest, but we didn’t mind. The food was good. At the intersection of Howell Mill and Collier Road there was a Springlake Pharmacy and a Sill’s Grocery store in the 1940’s. The owner of Sills Grocery Store, Mr Clyde Sills, died in May, 1999, at the age of 98. Sometime in the 1950’s the Springer Grocery was built at this corner. One of our Berkeley Park residents, Ed McGill, managed the Springer Grocery store. Another resident, James DuBose, owned a barber shop close to this intersection. This intersection was also the end of the street car line. At the time, Berkeley Park and surrounding areas were considered very rural. After WWI, in the 1930’s and 1940’s a number additional homes were built in Berkeley Park. Many of the owners of these and the existing homes worked for Seaboard Railroad. Some other residents worked for Atlantic Steel, some were small business owners, and some were employed by other businesses located nearby. Almost all the women worked during these years. They worked in businesses downtown, local eateries, and businesses nearby. Seaboard Railroad was first located on Old Chattahoochee Avenue, then called “Howell Yards”. There was an old bridge spanning the railroad tracks which has since been removed. Remaining are two large pipes which are still bridged over the railroad tracks. The pipes are seldom seen by passing traffic on the new bridge. The restaurant at the railroad was referred to as “The Grab”. The men working at Seaboard relied on the Grab for their frequent snacks, lunches and dinners, that were literally “grabbed” as quick as the train schedules would allow. There were also rooms to be rented for over night runs, and a company store sold food, clothes, shoes and many other items which the employees could not have afforded without the ability to charge towards their paycheck. Many of our residents have been fed, clothed and educated because of the railroad and their employment with Seaboard. There was a time when locals were allowed to fish in the lakes of the Atlanta Water Works. A bandstand by the lakes was frequented for picnics and musical programs. The street cars were vastly used by all of our residents during their time in the 1920’s through April 19, 1949, when the last car operated, car number 897! Georgia Power owned the street cars and they were operated by the Carmen Union. When the car reached the end of the line at Collier Road, the “motorman” would reverse the seats and the steering column. A resident recalls, “This was the area from which all the Atlanta livestock were taken from the railroad on the back side of the buildings on Brady Avenue and the front of White Provision Company. The streetcar had to switch tracks at this location and sometimes wait while the cows, horses and pigs were herded across the street.” Atlanta Stock Yards and White Provision Company were located at Brady Avenue and Howell Mill Road. Even in the late 1940’s, and early 1950’s the streets looked very different than today. Howell Mill Road was mostly lined with homes and I-75 did not exist. When I-75 was built, many homes and at least two streets we can identify, Kilgore and Holly Streets, were eliminated by the interstate. Prior to residing in Berkeley Park, some of our current residents lived on these streets, including Irene Boggs and Ruby Parker who lived on Holly Street. In the early 1940’s Berkeley Park had it’s first volunteer firemen. Bill Springer, of Springer’s Grocery contributed a truck, some hoses, and brooms to the cause. The truck was parked behind Crane’s Garage, when not in use. Then in 1948, a fire station, “Engine 23” was built in Berkeley Park. It was originally part of the Fulton County Fire Department. On January 1, 1952, it became part of the City of Atlanta Fire Department. The current building is the original structure. In November 1994, the city closed the station due to lack of funding. The first President of the Berkeley Park Neighborhood Association, Gwen Langston, was responsible for lobbying the city to reopen the station, which occurred September 18, 1997. As we look upon the arrival of the 21st century, our community is still very much a part of the past, as we share the wealth of past memories from those residents who molded our community into the jewel that it is today. 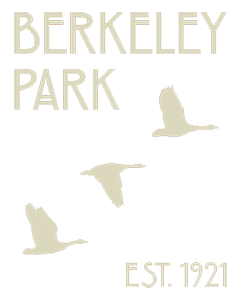 We are honored to have several current Berkeley Park residents that have lived here since the early 1900’s. Over a period of six months in 1999, each of these residents opened their doors and their hearts to share in the following memories of their lives in Berkeley Park. Each has imparted an endearment for this community that is truly beyond words. Their contributions to producing the history of Berkeley Park and the surrounding area was a valuable source of information. Following are some excerpts from these interviews. You will see that many of their lives were centered around our community well before their date of residence. We hope you enjoy reading their memories and comments. Katie and her husband were already living in Berkeley Park when they built their current home in 1950. There was an alley running along the side of their home. Bellemeade Avenue was dirt and gravel. Katie remembers many rides on the street car, catching the car at Howell Mill Road. Both of her children attended E.P. Howell School. Her husband, J.P., worked and retired with Seaboard Railroad as a switchman. Her children played ball on Howell Mill Road because there were few cars. Katie remembers shopping at the Springer grocery store on the corner of Howell Mill and Bellemeade and Mr. Water’s store. Their first home was #6 Tallulah Street in 1936, which is now a multi-family house for Georgia Tech students. They purchased their current home in 1942 for $1,900! Clyde canned a lot of her foods before moving to Atlanta. When her neighbors observed her moving the barrels of canned foods into their home they thought they were barrels of flour and were laughing at how much flour she had moved with her. Clyde remembers how quiet Antone Street was around 1942, “The children on Antone Street would play in the street”. M.P. (Paul) worked for the Simmons Bed Company on Jones Avenue and retired after 39 years of employment there. In 1938 Clyde went to work at Stone Baking Company. They have 3 daughters and 1 son, who all attended E.P. Howell School. Mrs. Patterson and the Borroughs family were close neighbors through the years. All their neighbors were great friends. A neighbor remembers Clyde’s good deeds, “Every time I came home with a new baby, Mrs. Clyde Black was always there with a roast, or cake and a willing hand. She is the best neighbor anyone could ever have”. Willie Mae and her husband, James purchased their home in 1955. They had two children, a son and a daughter. James was a barber at a shop on Howell Mill and Collier and he always walked to work. Next door to the barber shop was the service station that was owned by Dee Boggs, who is the husband of Willie Mae’s sister, Irene. Willie Mae lived on Ridgeway (Underwood Hills Neighborhood) in 1934. Willie Mae remembers the Gillen family, who lived on Howell Mill Road. She also remembers Frank and Elsie House. Frank worked at Seaboard Railroad. The Gilstrap family gave Willie Mae a special dress for her baptism. Verdal and her husband, Frank, had their home built in 1947. Frank’s brother-in-law, Mr. Williamson was the builder. They purchased their lot for $800. The area around their home was mostly wooded with a few cow pastures mixed in, including where Howell Mill Ridge Apartments are currently located. They were hooked up to the city sewer system in 1955, the same year the roads were paved. Edgar Garmon, Frank’s brother, lived across the street. Verdal and Frank both worked at Fulton Bag Cotton Mill for 39 years, until it closed in 1973. They made tent cloth and uniform materials at the mill. Margaret grew up off Lindburg Drive and attended old E. River School and North Fulton. She and her husband, John married in 1937 and moved to Berkeley Park in 1966. They owned Green Bag Company which made and sold different types of burlap and cotton bags. Later John worked at B&H Boiler Works for over 40 years. John was born on Marietta Street at Fort Hood Place. Another existing resident remembers John very well and recalled that “It is highly unlikely you would ever meet a man as happy, smiling, honestly glad to greet you, as Johnny Green!” Margaret worked for Elliott’s Business Machines for 18 years, which later changed names to Dymo, located on Antone Street in Berkeley Park. She still works as a bookkeeper for her son, Eddie Green, who is also a resident of Berkeley Park. Eddie’s father, John did some business with a fellow named Obar Hawkins. Obar built most of the steps and chimneys on Berkeley Avenue. Eddie can remember playing on Berkeley Avenue, while his father was conducting business with Obar, when he was between the age of 5 to 8 years. Eddie’s family lived on a dairy farm off DeFoors Ferry. He road the street car frequently and attended E.P. Howell School. Eddie remembers when a section of Collier Road that was west of Howell Mill was still a dirt road. When it would rain, the road would wash out. Then the city began laying rock and tar on the road and Eddie would attempt riding his bike over it. The rock and tar would stick real thick on his bike and him. When he returned home his mother proclaimed, “You are not worth cleaning up!”. Dorothy’s husband was in WWII. He was in the 10th Mountain Division in Italy. His parents lived next door to their home, which was built in 1940. Mr. Gregory and his father owned and operated a plumbing company from their home. The Gregory’s built a fish pond at the back door. Once, the city’s water main broke, increasing the water level in the creek at the back of their property and flooding their fish pond and yard. Katherine was actually born in her existing home on Holmes Street. Her home was first owned by her grandparents and then her parents – 3 generations of her family. Her grandparents purchased the lot in 1910 for $750, paying $10 down and $10 per month. Her father, Robert William Kent worked with Davison Paxon. Katherine attended E.P. Howell School and never married. While there were many opportunities to marry, she choose instead to take care of her parents “in this very house” until they passed away. Katherine worked at Davidson Paxon, (Macy’s purchased later) and then worked at Butterick Fashion Marketing for over 37 years. Katherine remembers the days of the soap-box derby on Northside Drive well. Johnnie grew up in this area and attended Rossville School off of Moores Mill. Johnnie and her husband, Aaron puchased their home in 1949. They are the original owners of the home. Apparently their lot was used as a dump site before their home was built, since it was sloping down a hill, people could just throw their debris down the hill. Aaron worked for Seaboard Railroad for 37 years. He often walked to work. A lot of the employees ate at a restaurant called the “Comic.” Johnnie worked at the Comic for 12 years. Frank and Jessie Mae Gormon owned the Comic. Johnnie has a son who attended E.P. Howell. Gwen was born and raised around the Georgia Tech area. She visited friends that lived in Berkeley Park. When Gwen was 6 years old her family purchased a home on DeFoors. Gwen attended E.P. Howell and then West Fulton, which brings to mind one of her first memories of the streetcars. “We would walk from our house on DeFoor Avenue to the corner of Howell Mill Road to catch the streetcar for wherever we wanted to go. We did not have an automobile and this was our only mode of transportation. I suppose at times we looked like a line of ducks as we walked the distance.” When Gwen married her husband, Bill, they also lived for about 17 years on DeFoors. In 1961 they purchased a home on Berkeley Avenue, which they resided in for 12 years before purchasing their second on Berkeley. Bill worked and retired with Seaboard Railroad. Bill often ate at the rail yard restaurant, called the “Grab”. One day he brought Gwen home a relic from the Grab, a large sugar bowl that held about 1 pound of sugar which was used on a table at the restaurant. Gwen and their 2 children often used the train for trips to a variety of places. Katie was born in Summerville, Georgia and her husband, Taylor Conley, “Shorty”, was born in Trion, Georgia. Katie’s parents were farmers. In 1960 Katie and Shorty purchased their present home, which was built in the 1940’s, from Herb Miller. Conley’s uncle lived in Grant Park and encouraged them to move into the area. Katie and Conley have a son. Conley worked Seaboard Railroad and retired from there after 34 years. Conley often had lunch at the “Grab” restaurant. Katie remembers “Conley would run his hunting dogs on the land where the Castlegate Hotel and I-75 are now located”. She also remembers, “The old wooden streetcars on Howell Mill Road and the old water tank at the railroad yard on Chattahoochee Avenue.” When Conley first went to work for the railroad he made 36 cents per hour, $85 per month. Katie worked at several places, Automatic Spooler, Nurser, Bra Plant, Sun Halter Plant, and Dymo Industrial and Fulton Bag Cotton Mill. Katie made $15 a week at the Fulton Bag Cotton Mill in 1941. Three generations of Ruby’s family have lived in Berkeley Park. Ruby was born and raised on a farm that was within several yards of Berkeley Park, approximately where I-75 and Northside Drive exist today. Ruby’s father, Edward Born grew and sold vegetables to the local grocers, including Springer Grocery. He delivered his goods with a mule and horse. They never owned a vehicle. Ruby had 12 siblings and she attended the original Evan P. Howell Grammar School on Bowen Street, on the west side of Howell Mill Road. Ruby remembers Mrs. Spencer, who owned a large farm that occupied an area that today would be the corner of Bellemeade Avenue, west of Howell Mill Road. This was before 1928, when Evan P. Howell was built. Mrs. Spencer would not allow the city to cut a road through her land, so people would drive their cars or horses through her land to get between what is now a section of Northside Drive and Bellemeade Avenue, in order to access Howell Mill Road. Mrs. Spencer’s farm house was located at what would today be the corner of Northside Drive and Bellemeade Avenue. James Edwards, Ruby’s husband, worked for and retired from Gaylord Paper Company. Ruby worked for the Marietta Bomber Plant assisting in assembling airplanes during WWII. Mattie actually met her husband, Jim, on Bellemeade Avenue! She knew they would be together from the first moment she saw him get out of a taxi on Bellemeade Avenue. Mattie, her mother, and sister moved from Cummings, Georgia to Bellemeade Avenue. After Mattie and Jim were married, they puchased their current home in 1936 for $1,000. Jim worked for Atlantic Steel and later owned and operated “Thompsons’ Garage” on Bellemeade Avenue, with 2 of his brothers. Jim died of a heart attack in 1967. He was in his 40s at the time. Mattie later started her own business from her home making exquisite custom made draperies. There are many more residents of the past, whose names have been mentioned. Rochelle and Robert Harden lived at 1583 Howell Mill Road in 1922. Robert retired with Seaboard Railroad and they continued to live in their home for 47 years. Estelle and George Wallace rented a home on Verner Street, and later purchased their home at 805 Antone Street. George worked for Seaboard Railroad. Mrs. Earnest lived on Howell Mill near Verner Street. George Wallace, Jr. rented a room from her after moving out of his parents home. The Phillips lived on Verner Street, near Howell Mill. Dr. Puckett and family lived on Howell Mill where the Florist is currently located. Mrs. McElroy lived on Holmes Street across from the Church. Mrs. Moon lived on Holmes behind the Church. Policeman Perry lived on Holmes Street. The Rogers Family lived on Holmes Street. Edna and John Burroughs lived on Antone Street. Each and all hold a special memory in our past. In closing, we would like to give a special “thanks” to Gwen Langston. In 1993, Gwen and Betty Massey, a fellow member of Northside Park Baptist Church, spent a year of their time gathering memories of the past from members of Northside Park Baptist Church. Their intent was to share the history of their church, similar to our objective to share the history of Berkeley Park. We were able to gather some pieces of history from their writings, which often included some of our Berkeley Park residents. Most important, a very special “thank you” is extended to each of our long-term residents. Our community is grateful for your presence, and the contribution you have imparted to make Berkeley Park the unique community that it is today. This article was composed by Linda Alcott.